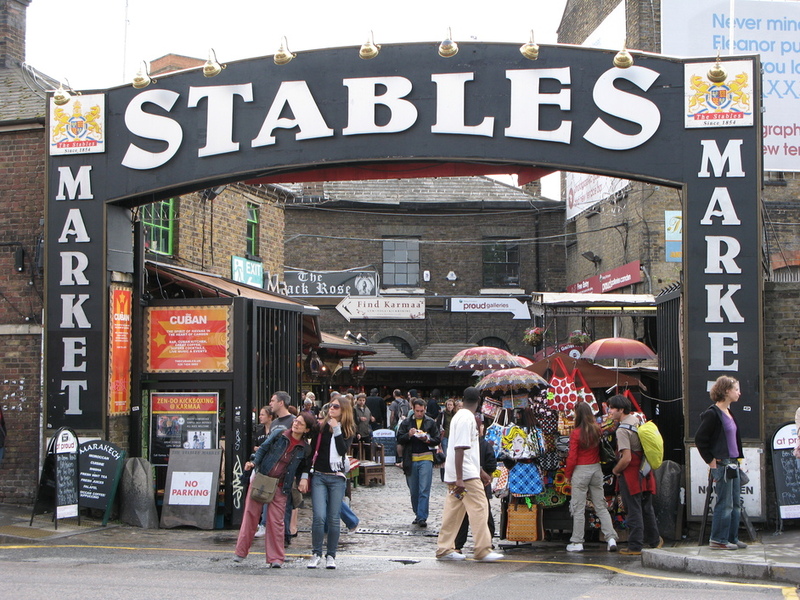 Camden Stables Market gets its name from its previous incarnation as a horse hospital. In Victorian times, the stables were where horses injured pulling barges down the canals would come for treatment. Now it and the catacombs under the arches opposite have been combined under the umbrella term 'Stables Market' and together make up the largest of Camden's popular market spaces. Over 450 shops and stalls are housed here selling a variety of antiquarian and unique items from accessories and jewellery to furniture and clothing. Even media mogul Chris Evans famously has a stall here. If you tire of shopping and gawking there's plenty of entertainment within the market with the highly acclaimed Proud Gallery offering excellent photographic exhibitions and hip bar At Proud with its terrace attracting beer and sun worshipers in equal measure. Alternatively, if it's an upmarket meal you're after, try Gilgamesh restaurant for good quality dining. Fitness fans can practice tai-chi or indulge in some reflexology at the Karmaa gym/health centre and plenty of celebrities do. As of 28th August 2007 part of the Stables Market closed for refurbishment affecting 55 businesses. The new development reopened on 1st March 2009. What are the best dining options near Camden Stables Market London? Camden Stables Market gyms, sporting activities, health & beauty and fitness. The best pubs near London Camden Stables Market. Camden Stables Market clubs, bars, cabaret nights, casinos and interesting nightlife. Where to have your meeting, conference, exhibition, private dining or training course near Camden Stables Market. From cheap budget hotels to luxury 5 star suites see our special offers for Camden Stables Market hotels, including Danubius Hotel Regents Park from 0% off.